It takes a strong service game to win in tennis, as well as to win at building a community of tennis players. Our Foundation Board is comprised of individuals who have a heart for tennis and a passion for fundraising. We welcome Volunteers wanting to help with our Fundraising efforts. As the fundraising arm of USTA Southwest, the SOUTHWEST TENNIS FOUNDATION, INC. is a separate 501 (c)3 entity that provides financial support for the mission of the Section, which is to "promote and develop the growth of tennis" throughout Arizona, New Mexico and El Paso County, Texas. Since the creation of the Southwest Tennis Foundation in 1996, it has raised funds for, and given many thousands of dollars in scholarships and grants to junior players, wheelchair players and to programs that develop and support a wide range of tennis activities. That includes those of special populations and diverse groups. The Southwest Tennis Foundation has also given money to events whose goals are aligned with developing our sport at a wider and deeper level. Additionally, adult education scholarships have helped get volunteers to training workshops that give them the skills to go out and develop and improve the quality of grassroots programs in their local communities. The Southwest Tennis Foundation is 100% reliant on donations and fundraising efforts to fulfill its charitable good works in our tennis communities. Our mission is simple: To Enrich Lives Through Tennis & Education. We are always looking for help to get the word out about the mission of the Southwest Tennis Foundation, to raise additional funds, and to recruit and educate more volunteers to help us in this endeavor. Contributing to this cause is tax-deductible. 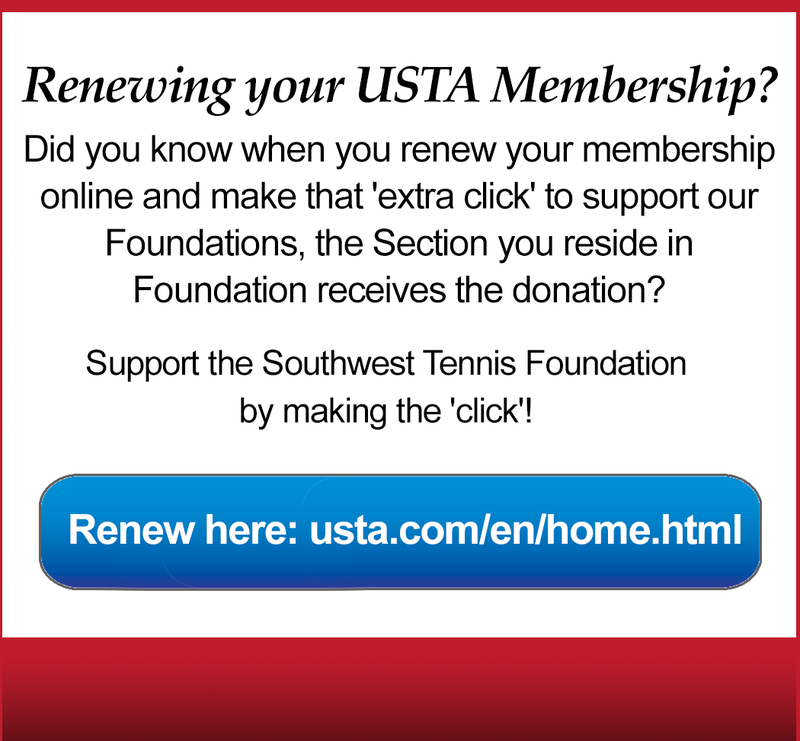 For more information about the Southwest Foundation, or to apply for funds for need-based scholarships or grants from the Foundation, please contact the USTA Southwest Section office directly at (480) 289-2351. A special 'thank you' goes out to all those that do donate, or have donated in the past to the Southwest Foundation. Your contribution - no matter how small - is tax deductible, and goes a long way towards supporting and developing the sport in our communities. Copyright © SWTF. All rights reserved.